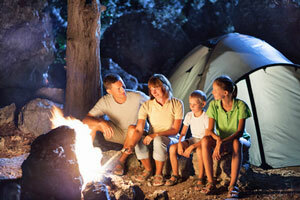 Find campgrounds with all the right amenities and outdoor activities for your vacation. of the finest campgrounds in California. & all up and down the Sierra Nevada. For Every Campground . . .
Are you looking for a special kind of campground? Perhaps you are trying to find equestrian group campgrounds or beach camping. Check out the campground guides below to narrow your search. 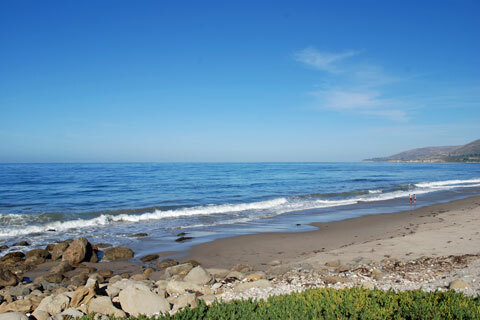 A list of all the most popular California camping areas, with links to campgrounds in each area. 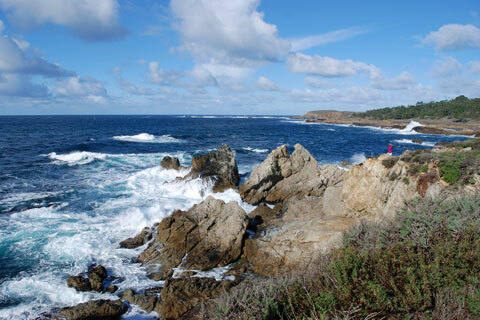 Recommendations of wonderful California camping spots for families with children. Coronado to Eureka - find a California campground that looks out on the ocean. Individual or group campsites designated for people with horses. An index of more than 600 California campgrounds that rank as the Golden State's best. With snow in the mountains it is hard to believe it is time to make summer camping reservations, but if you want your favorite campsite reserved, mark your calendar and make your reservations at the first opportunity. Most federal campgrounds (Forest Service, National Parks) use Recreation.gov for their reservations. For most campgrounds you can make reservations up to 6 months in advance of your arrival date. Reservations are opened up in monthly blocks at the beginning of each month. For those wanting to camp over Memorial Day weekend and in June, it is time to get your reservations. 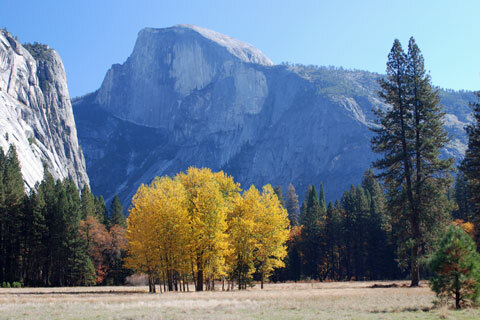 Yosemite National Park's reservable campsites are available up to 5 months in advance on the 15th of each month at 7:00 AM (PT) or 10:00 AM (ET). For example, on January 15, the time period May 15 to June 14 becomes available to reserve, and therefore, the full booking window would be from January 16 to June 14. California has its own reservation system - ReserveCalifornia. Under this system new campsite reservations become available every day, 6 months in advance of arrival date. The reservation window opens at 8:00 AM PST each day. 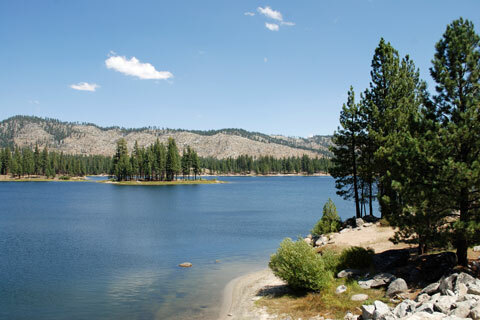 Shaver Lake's Camp Edison takes reservations in 2019 for Group Sites when booking 7 to 14 nights on January 1 through 15. Beginning on February 4 at 5:00 AM reservations will open for single or group sites when you book for 7 to 14 nights. Then, beginning on May 4 at 5:00 AM, reservations are open for campsites for any number of nights up to 14. PG&E Campground reservations can be made beginning April 1, 2019. In the past PG&E has opened up reservations for one full week of camping or more (up to 14 days) before reservations for shorter stays. Then 2 weeks later they open reservations for stays from 2 days up to 14 days. This year that second date would be on April 15. We assume that will be the case again this year, but check on April 1, beginning at 8:00 AM to be sure. Gold Star - The best of the best campgrounds. 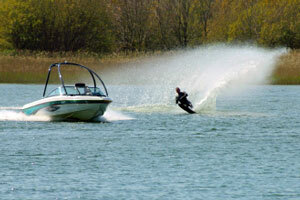 Not only are the campgrounds equipped with very good amenities and in beautiful settings, they are close to outstanding recreational opportunities such as natural wonders, waterskiing, beaches, or special attractions. 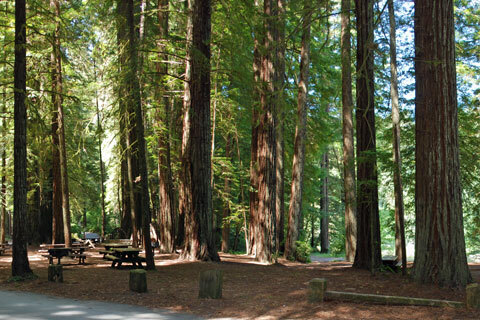 Green Star - Campgrounds with good facilities and located close to a variety of activities, whether its trails among redwoods, a beach-front location, or a beautiful mountain lake. Green Triangle - Comfortable campgrounds equipped with basic amenities and near some worthwhile recreational attractions. These are sometimes smaller, more remote campgrounds which, nevertheless, may have exceptional views. Ease of driving access is sometimes a consideration. Green Dot - Campgrounds we have not included in our reviews, either because much better campgrounds are nearby or because the facilities or available recreation opportunities are negligible. Everyone's interests are different, so a perfect campground for one might be only mediocre for another. Use our symbols as a starting point on your quest to find the best campground for you. Our reviews include publicly operated campgrounds such as Forest Service, National Park, State Park, BLM, and Army Corps of Engineers campgrounds. We also include many regional and county park campgrounds along with campgrounds offered by public and private utilities such as electric companies and irrigation districts. We do not include private RV Parks nor most privately operated campgrounds. Prices listed for campground stays are the basic campsite fee and do not include any reservation fees. Often there are discrepancies between the fee shown on the campground agency's website and the price listed by the reservation website. In those cases, we have displayed the higher of the two. Every effort is made to provide accurate and up to date information, but we cannot be responsible for errors or for changes that may have occurred since publication. Always confirm information with the service provider and check for any recent changes that may have been made. The information provided on this website is done so without warranty of any kind, either expressed or implied, including but not limited to, the implied warranties of merchantability and fitness for a particular purpose.